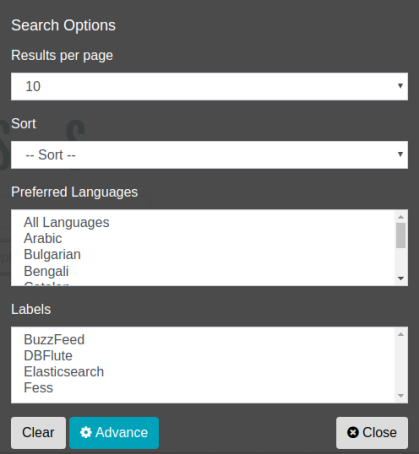 Fess is able to assign labels to documents at the indexing time and Label search categorizes documents into the labels on the search result. To register a label at administrative page, you can select the label from Search Options. You can select labels at search time. To click Option button at the right of Search button on Search page, Search Options dialog is displayed. Labels are assigned to documents at the indexing time. If you want to update label information, you need to reindex documents.